If you’re the kind of traveler who likes to fill your time with the best a place has to offer — at least according to the locals — here’s a rundown of not-to-miss hits. 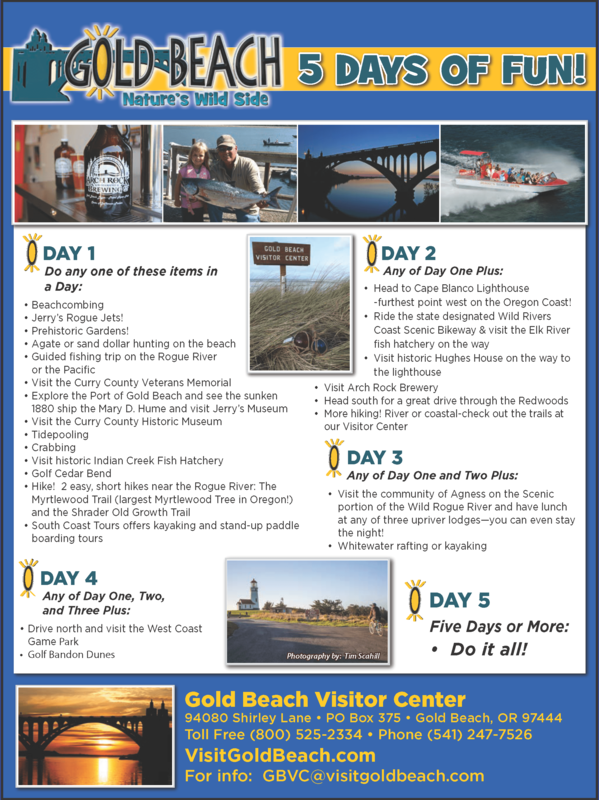 Check the links for more information on what to do while you stay in Gold Beach. Head for the Port. In addition to lots of great boats, you can count on barking sea lions lazing in the sun, an 1880 vessel sunken in the harbor, and even a small museum. There’s the fish market for picking up tonight’s dinner and incredible fresh shrimp and crab cocktail for right now; shops offering fresh ice cream and foaming cappuccino; gift stores featuring the work of local artists. And of course you have to rent a crab ring and go crabbing! Any local will tell you to plan a half-day Jet Boat trip, probably Gold Beach’s most unique and famous attractions. Then you could spend the rest of the day tooling around the Port (above), or on the beach hunting for agates. Finish with a sunset dinner in an oceanfront restaurant. Sneaking in a game of golf is well worth it; nearby golf is close to town and a world away — so quiet and beautiful. Even if you’re not an angler, you might become a lifelong fan of fishing if you try it in Gold Beach. Consider renting some tackle and casting a line in the river for steelhead, salmon or trout. You could charter a boat that goes out to sea, or even cast from the shore. After your jet boat trip — you did go on a jet boat trip, didn’t you? — you might be ready for a whitewater adventure of a different kind. Look into whitewater rafting; the area has plenty of guides. Or imagine yourself on the back of a beautiful horse, gracefully cantering down the beach as the sun sets over the ocean… Actually, quit imagining and make a reservation. Call Hawk’s Rest Ranch 541-247-6423 where you can rent horses for just such an adventure. Driving trips are as scenic as it gets, and there are a few directions you can head. Especially recommended is the stretch south to Crescent City; you’ll see some of the finest coastline in the country (yes, country). Might as well keep going a bit further south and visit the redwoods, while you’re here. From Gold Beach you can also go east up Jerry’s Flat Road on up to Agness, a nice little community to visit, with its one-room schoolhouse, RV park, hiking trails and the Old Agness Store, where you can get a quarter pound old fashioned hot dog with the works. Get stuck in the sand. Oregon coastal sand dunes are very popular for seeing, for rolling down and for driving around on in a rented dune buggy. Closest dunes are in the Charleston/Coos Bay area, and there are several buggy rental outfits that will take care of you. Sleep where no cars dare to go. Several upriver lodges are accessible only by jet boat or air, so leave your wheels in Gold Beach and spend a night or two up in the wilderness. Pan for gold? Well, yeah — lots of people do. Gold made this town in the mid-1800s, or at least got it started, and it’s still a fun pastime. Pick up equipment and advice, then go out and strike it rich. If it’s late summer, local riches include blackberries. Wild blackberries are a free-for-all snack that grows alongside most roads heading up into the hills. We suggest pulling over and picking away from the main roads, which are sometimes sprayed with pesticide to keep these prickly plants in check. And keep an eye out for poison oak! Weather kicking up? Storm watching is a bona fide activity in Gold Beach, so settle into your oceanfront hotel room and watch the show. If you get some winter snow in the local hills you might want to take a quick drive and throw a snowball or two. Indian Creek Hatchery gives tours, if you arrange for one in advance. Originally opened in 1877, this operation is always fascinating for fishermen to see, and sometimes the family likes it, too. Some people create an entire vacation around visiting the lighthouses up and down the Oregon coast. One of the best is close to Gold Beach: Cape Blanco Lighthouse and the Hughes House are the state’s oldest, and guided tours are available. 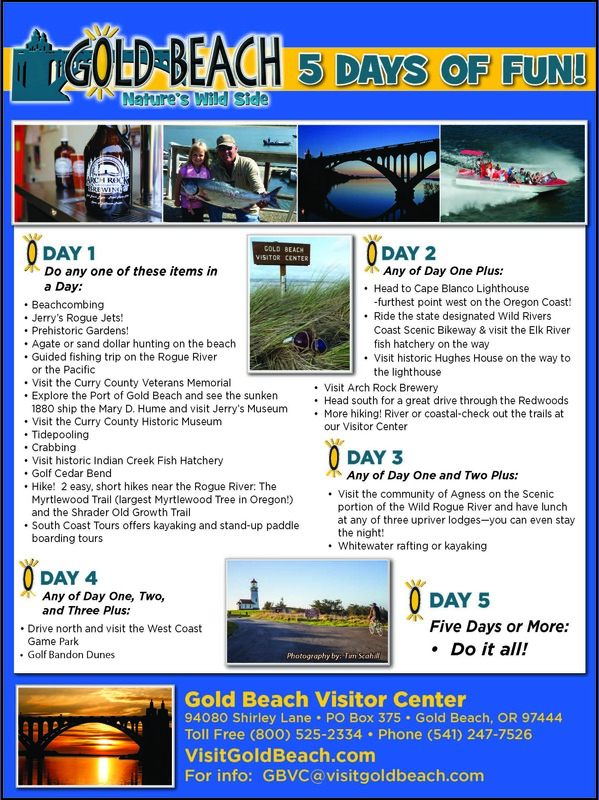 For information on others, ask for the “Oregon Coast Lighthouses” brochure at the Gold Beach Visitor Information Center. A fairly ambitious but do-able (and very worthwhile) day trip is to the Oregon Caves National Monument at Cave Junction. Above ground is a remnant old-growth forest with a fantastic array of plants, plus a Douglas fir with the widest known girth in Oregon. Three hiking trails access this forest. Below ground you can travel along a half-mile trail into an active marble cave created by natural forces over hundreds of thousands of years in one of the world’s most diverse geologic realms. Hiking your thing? You could spend your entire week on foot and never see the same trail twice. Stop by the Forest Service office in downtown Gold Beach for maps, passes and information. The most exciting hiking might arguably be found in the Kalmiopsis Wilderness, a designated wilderness area that’s legendary for its plant life. A good number of websites and guidebooks offer information on the Kalmiopsis; we suggest lots of homework before heading out. Still looking for things to do? Have a conversation with any local and ask where they take their guests!